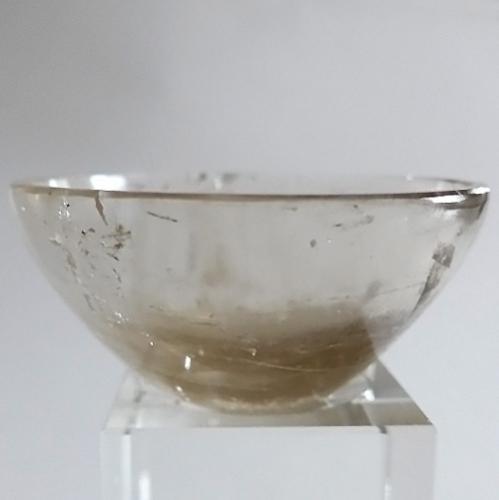 Dimensions (HxWxD): 1" x 3" x 3"
This beautiful translucent smoky quartz altar bowl is 1" high and 3" in diameter, and weighs approximately 103 grams, 3.6 ounces, or nearly 1/4 pound. This lovely smoky bowl is an ideal size to place on your altar, side table, night table or computer workstation. We fill ours with offerings of flowers, gemstones, tiny figures of gods or goddesses -- the possibilities are endless. As you can see in this group shot, each of these smoky bowls is unique and beautiful, and we know you will be delighted with the one we choose for you. 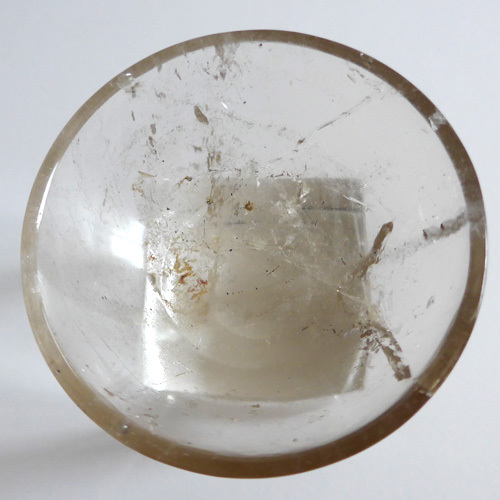 There are a variety of mica-like inclusions and other small inclusions from the matrix surrounding these crystals that add to their individuality and charm. Smoky quartz has been a favorite healing stone of shamanistic practitioners around the world for thousands of years. 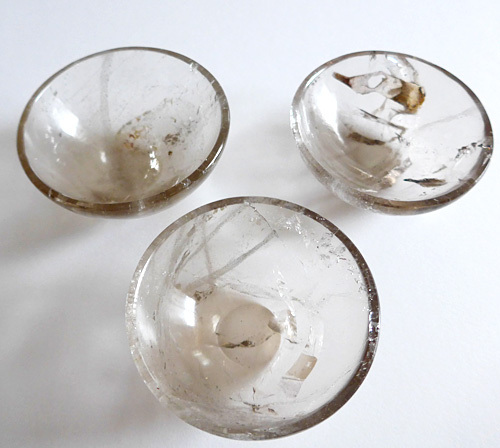 Mineralogists say there may be more than one cause for the gray to brown to black color range of this very popular form of quartz crystal, ranging from sodium to other minerals in the crystal. Other mineralogists suggest other theories concerning the dark pigment in smoky quartz, including: the presence of trivalent titanium; the presence of carbon compounds. We know you will use this powerful crystal with loving wisdom and respect its journey in the Earth for many long historical cycles which has developed its unique metaphysical properties and beautiful appearance.. Note: Average weight is 103 grams, 3.6 ounces or slightly less than 1/4 pound. Average dimensions listed above. Each piece is guaranteed to be beautiful & to meet with your complete satisfaction!